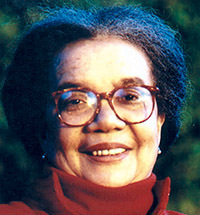 Marian Wright Edelman, Founder and President of the Children’s Defense Fund (CDF), has been an advocate for disadvantaged Americans for her entire professional life. Under her leadership, CDF has become the nation’s strongest voice for children and families. The Leave No Child Behind® mission of the Children’s Defense Fund is to ensure every child a “Healthy Start, a Head Start, a Fair Start, a Safe Start, and a Moral Start” in life and successful passage to adulthood with the help of caring families and communities. 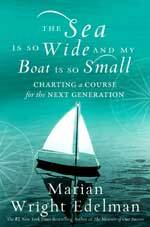 Edelman’s newest book, The Sea Is So Wide and My Boat Is So Small: Charting a Course for The Next Generation (Hyperion) is a call to all Americans urging them to commit to ending child poverty in this country and to address the myriad systems that help fuel the cycle of poverty. Edelman, a graduate of Spelman College and Yale Law School, began her career in the mid-60s when, as the first black woman admitted to the Mississippi Bar, she directed the NAACP Legal Defense and Educational Fund office in Jackson, Mississippi. In l968, she moved to Washington, D.C., as counsel for the Poor People’s Campaign that Dr. Martin Luther King, Jr. began organizing before his death. She founded the Washington Research Project, a public interest law firm and the parent body of the Children’s Defense Fund. For two years she served as the Director of the Center for Law and Education at Harvard University and in l973 began CDF. Edelman served on the Board of Trustees of Spelman College which she chaired from 1976 to 1987 and was the first woman elected by alumni as a member of the Yale University Corporation on which she served from 1971 to 1977. She has received many honorary degrees and awards including the Albert Schweitzer Humanitarian Prize, the Heinz Award, and a MacArthur Foundation Prize Fellowship. In 2000, she received the Presidential Medal of Freedom, the nation’s highest civilian award, and the Robert F. Kennedy Lifetime Achievement Award for her writings which include eight books: Families in Peril: An Agenda for Social Change; The Measure of Our Success: A Letter to My Children and Yours (Harper Paperbacks); Guide My Feet: Meditations and Prayers on Loving and Working for Children (Harper Perennial); Stand for Children; Lanterns: A Memoir of Mentors (Harper Paperbacks); Hold My Hand: Prayers for Building a Movement to Leave No Child Behind; I’m Your Child, God: Prayers for Our Children; and I Can Make a Difference: A Treasury to Inspire Our Children (Amistad Childrens). She is a board member of the Robin Hood Foundation, the Association to Benefit Children, and City Lights School and is a member of the Council on Foreign Relations, the American Philosophical Society, the American Academy of Arts and Sciences, and the Institute of Medicine of the National Academy of Sciences.